Thanks to DwarvenDervish's suggestions, I decided to try shrinking down normal trees for the Overland map in order to keep it a seasonal look, and it's looking very good. I am now very pleased with how the Overland map is coming out. 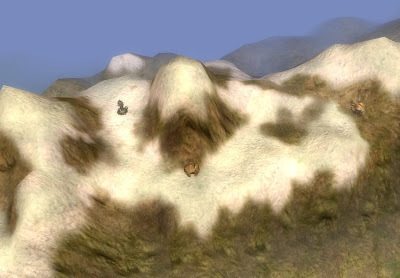 This is a tilted view from Silverymoon looking toward Silverymoon Pass in the Nether Mountains. I changed up the texturing and you can see this is looking very good. I am also very impressed with the way the Silverymoon Pass came out. I used a little brown and orange coloring on the textures to make the mountainside and "broken" land of the pass come out. On top of that the area around silverymoon now look very authentically Autumn. I probably could do a better job with the textures, but I think this will do for an overland map. Basically each part of the Moonwood I'm making are going to have a slightly different forested look as in the above example. This is the place around One Stone and the Sky Pony camp. These two points are map locations. The one to the right is One Stone, the one to the left is Dragon's Heart, both of which you've seen in previous areas I've designed. In this specific area I've been able to match the textures to those I used in that specific location. And it's turning out really well. When this map comes out it's going to be a very subtle blend of one environment into another, into another. 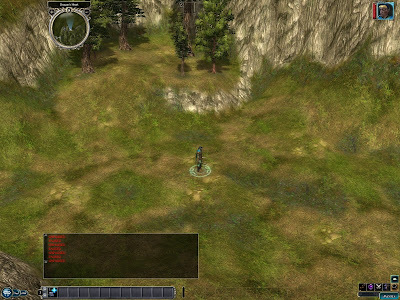 As in the example of a completely different texture pattern around Quaervarr in the Southern end of the Moonwoods. 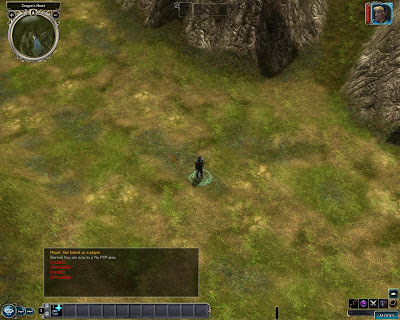 You'll notice older areas of my Blog I showed Quaervarr and the screenshots of what the area looks like. Well this was no exception. I've mapped the texture pattern as close as possible to Quaervarr so it will seem a smooth transition when you enter the town. Keep in mind this will have Tree coverings I left out so you could see the texture job. Admittedly though I am having to squeeze and get really creative with textures, because you're only limited to 6 textures in any 4 square area, and sometimes to get the environments correct I'd need a good 8 because of the blending from one environment to another. To close... it is an intricate job, as you can see I have more of the Overland map done, but it's still not a large amount. But if you want to do it right... it is an intricate thing. Working on Asberdies again after the new addition of the Overland Map to NWN2. This is a lot more intricate than I'd have suspected. 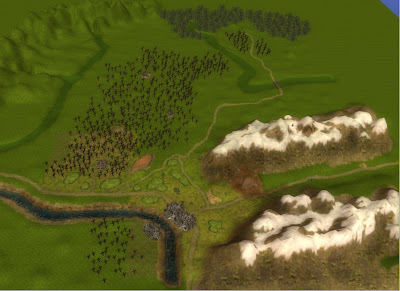 Basically this kind of gives you an overview of the area Asberdies takes place in. While it's not even near complete I was asked about how far I was with regards to getting my hands dirty so to speak and this is the beginnings of what I've started with as an overland map. 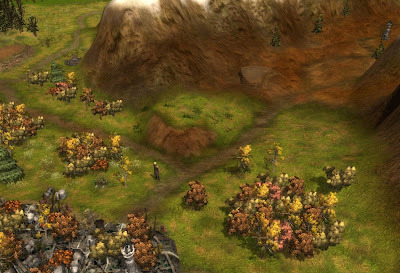 The area is the area North of Silverymoon with the Moonwoods to the North and the Nether Mountains to the East. Obviously the trees you see in the middle are going to have the foliage cover you see in the Storm of Zehir expansion when going to the forests but you can at least get a good glimpse of the skeleton I have started with and the base texturing I'm laying down. This is supposed to be taking place in the autumn as you can see by some of my past posts on this, but I won't necessarily be able to do that on the overland map mostly because the placables Obsidian made for the overland map are summer time placables, so I'm going to have to pull off a half assed mix of summer/autumn type texuring. This is the texturing around Silverymoon and I may still change it, but it's looking overall to be workable. We'll have to see though, it's just a start and I may change my mind. So far though I think I like it. One of the places I started with was the Nether Mountains since that's one of the locations you'd be going to is the Tomb of Dekan Thar. And I admit that's coming out really well. Silverymoon pass is looking very nice, as is the upper reaches of the Nether Mountains that you'll be going to. 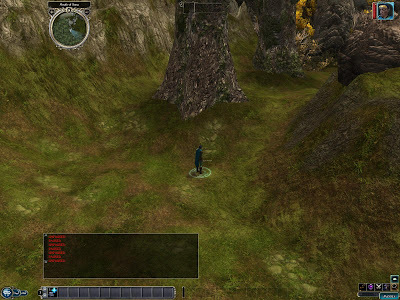 This is the place you'll be going to in order to find another of the Asberdies stones. And you'll come up against Yetis and other assorted snow creatures, assuming I can find them. Thankfully there's now Wights in the game so I can do the Tomb of Dekan Thar properly. Previously I thought I'd have to do some major cheating on it. Well that should do it for an update. Admittedly now that I've added some of the Tree overhead before Placables it appears that the texturing job will be fine, But Frank may be right. 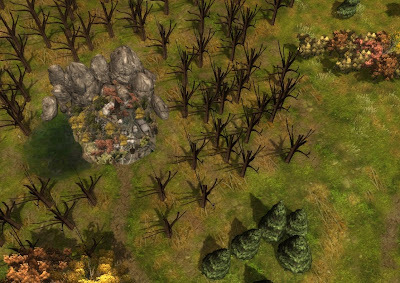 I might have to make lighting adjustments instead as it requires full shadows to get the correct view of the forest. I think this will do, but I've been thinking about what Frank said about it. Perhaps ignoring the full shadows and going with a total lighting adjustment with placed lights. I have looked at the area with full shadows and without and admittedly without shadows and some various placed lights may very well be the ticket. We are looking to firm up date, time slots, and participation. I know that many players at Connections will be familiar with your work and eager to listen in - perhaps submit questions. Above all - as I indicated we are looking to be inclusive on NWN2 and so have a proper NWNCon online that represents the "larger community" and puts to rest unneccessary division of the game. We have a number of members (i.e. Carlos) active in building (DMFI) in NWN2 and so hope to continue a home at connections for multiplayer. - all on areas, toolset use, tips and practices, saving, most useful plug ins, challenges, current state, well just about all the above and what you look forward to. -Mel - a unique sort of subject on her(his) Bishop Rommance , voice sound recording as she(he) is active in this I believe. Wow... yeah a little side tracked. On top of being addicted to Mass Effect for the last week, I've admittedly gotten a little behind with regards to building. You know, you can tell where Mass Effect was dumbed down for the console crew, but at the same time Bioware managed to overcome the limitations of the Console at least to a certain extent, and on top of that, the backstory in the game has a depth and richness I haven't seen in some of their games in a very very long time. The more you explore, the more you find. It's a veritable smorgasbord of story depth all hidden that you can find little by little. The more you find, the richer it becomes. My addiction level to the game is finally subsiding so I'll be building again, but I'll be honest it's one of the best games I've played over the last year. It tops Bioshock and Crysis as far as sci-fi goes and the depth of the world around it is just unbelievable. I had meant to build a bit this weekend, but I friend's Bachelor party distracted me this weekend. Wow... I don't think I was sober all weekend. We bumped into a Bachelorette party while we were out there too and I know I ended up with a Bachelorette's garter I remember tongueing it off her leg, and there's pictures of me wearing it like a bandana over the weekend (wow those things stretch, she was a tiny girl), so while a lot of things were a blur, I am pretty sure I had a lot of fun. Well back to building, I have started on Mouth of Song, but admittedly have only gotten the height map done. The little speck on the hill is a human. This area is going to look like Deep forest. The trees here will be huge. In the Forgotten Realms there is a tree called a Shadowtop. Basically they are enormous trees that blot out the sun in a deep forest. I'll be using live oaks scaled up by a factor of 3. They'll actually be taller than the hill. I'll also be turning off the fade for them (which works now by the way). Mouth of Song is a small shrine to Elistraee, it will have a night and day cycle and if players enter at night they will run into a coven of Ellistraee worshipers here. They will then send you to the Grove of Fangs to hunt for more clues in order to find Claw Hollow. I may add some encounters here, daytime perhaps some kind of Trolls or perhaps some Wyverns along with a nest nearby. At night perhaps a Drow Raiding party looking to kill some Ellistraee worshipers. I'm going to have to decide on the Texturing though, the ones I've tried so far haven't looked the way I wanted it to, so We'll have to see how it comes out. Ok I've moved on to laying down placables, the Image you see is the same one you saw in the last two updates. First I layed down the texturing, then layed down grass and placables. You'll notice I had to keep the middle side of the placables to a minimum as I lay this down as I have to leave space for a very large Dragon to come through. This should give you an Idea of what the area will look like as a total package when it's finished. I will most likely have it done this weekend and then will move on to the Grove of Silk or Mouth of Song, one of the two. One is a shrine to Elistraee, the other is going to be the place they will send you to find another clue to the location of the mysterious Claw Hollow. Well I finished texturing Dragon's Heart last night, all that remains is foresting it. Technically that's going to be very easy to do though I have a bit of hinkiness with regards to that. Because the walkway paths have to be clear enough for a large object to move through I'll have to watch how I do things and make sure that I don't block the paths with things. I won't be showing a screenshot of the whole area until it's done... but I suspect that these little pictures I put up will, if you're pretty bright... be able to help you pick up the texturing techniques I use for blending textures while building. I'ts part of the reason I keep posting these unfinished pictures so you can see how it's built as it's built. I already included a couple of secret things built into it, so it will reward the explorers and those who like to comb the map and see the little things most will miss. I suspect the area, while beautiful will also impose a sense of danger, especially when the Dragon appears. 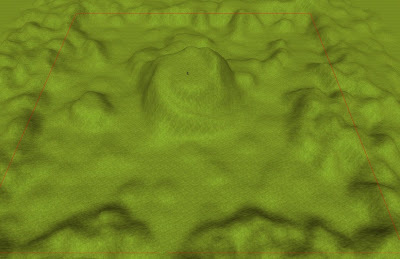 You will also be able to walk on those middle hill areas and be able to scan down on the area below. I suspect I will hide things up there too. This whole area will be a search for the clue hidden on the body of the Sky Pony tracker through a dangerous and deadly area where you won't be able to rest, thus heightening the sense of urgency. It will be one of those where people say, "Oh my god this is beautiful" but I can't stop to let my guard down or I'm going to die. Granted I've been playing Mass Effect recently so it's cut into my time a little, but I did get a little more done. Admittedly Mass Effect is a really good game. It kinda reminds me of a combination of KoToR and a very old game about hopping planets and collecting ore while trying to solve the mystery of why the Suns in each system were going super nova. In the end you discover that the fuel you are using... these rocks, are actually a life form that moves at a time rate much slower than ours, so they appear to be normal rocks but are actually alive, and you've been using them as fuel to power the starships. Over the centuries they've come up with a way to stop the elimination of their race after finally discovering they are being killed off in a mass genocide. Cool game about exploration and mystery. Hard though. I can't remember the name of it but I know I played it again recently. I've textured quite a bit now and only have the bottom half and the ledges left. 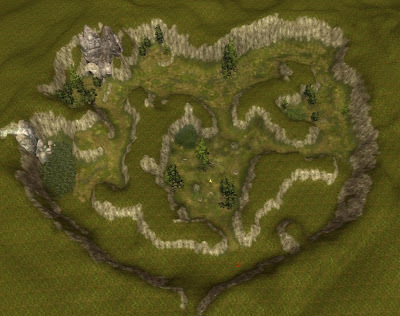 The Idea of the Height map was to form the shape of a heart shaped valley. As I get closer to completion I can see that it's achieving it's goal very well. You know what's funny about doing the Infinity Engine style texturing like this? It looks like crap from above, but the closer and closr you get, until you are at the player's level... suddenly it looks spectacular. 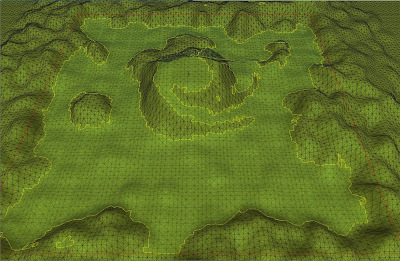 This is what that top portion of the map looks like as far as texturing without any placables or grass or anything. This is just what it looks like painting it down. So it's kinda funny... the worse it looks from the top... the better it looks from the ground. I suspect once I add placables and grass it will be very stunning once I've gotten it all put togather. Well I'm starting on a new area today called Dragon's Heart. I'm just starting but I wanted to give a rough idea of how things always start out when I do this. 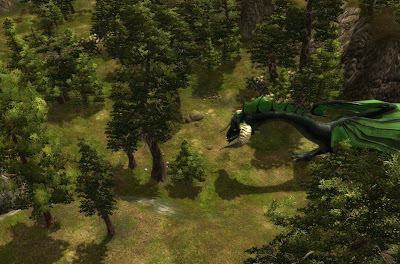 I was thinking to myself over the last couple days... hmm you know, you never get to see Dragon battles in NWN2 much, and it's not because there aren't any Dragons, in fact there's 5 of them. I suspect it's because they are so high of level most modules aren't made for it. I had been looking through the toolset trying to decide what I wanted for my second add on area. I knew one of them was going to be a Spider filled forest, but for the second one I kept asking myself what is it's theme going to be? It's going to be the place the Sky Pony tribe sends you for clues to the location of Claw Hollow... but... what is it once you get there? Well putting all that togather I came up with an idea. Now obviously it's just starting, so... given the texturing in the pictures of my other stuff you can see how it's going to turn out. 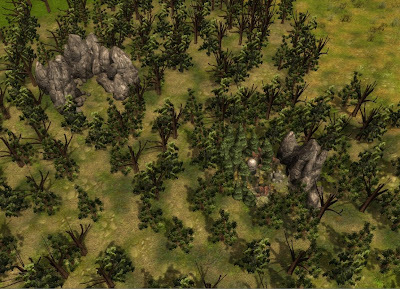 I'm, using the same texturing and forest look as in One Stone. The Sky Pony Tribe calls this place Dragon's Heart, both for the shape of the valley and what lurks there. They tell you one of their trackers was lost there while attempting to track the Lycanthropes to Claw Hollow. Well do you see all those little valleys? A Black Dragon named Ix'chidgit Monlaesus lets her Wyrmlings loose here to hunt and practice their skills on the local Troll population. Needless to say the Trolls are terrified of them. Now if Trolls weren't so stupid they'd probably ask you for help, but it's doubtful they could even communicate with you let alone ask for help. Besides, they're hungry too and would like nothing better than to have yo for dinner as well. 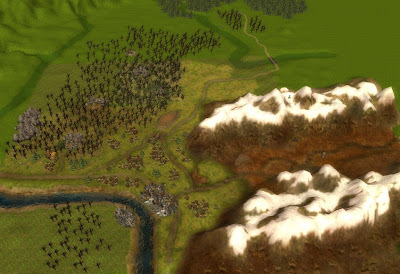 So this Valley is going to be populated by Trolls and the Black Dragon Wyrmlings hunting them. The Wyrmlings will be on little patrol paths around the valley. And you'll most likely run into Trolls as well. Given that the party will likely be 10th level at most... and that an Adult Black Dragon is 19th level... she's probably going to chew you up and spit you out faster than you can say boo. So if you don't run you're going to die unless you're really really good. It will be a fight you won't soon forget. But you don't have to beat the Black Dragon to clear the area, all you have to do is make it out alive with the clue that is on the body of the Sky Pony tracker who was on the trail of Claw Hollow. 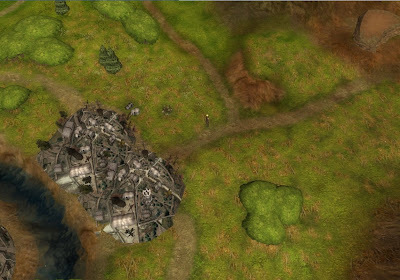 If you actually succeed though in killing Ix'chidgit, it will open up another area on the map... her lair.